In order to be able to send screenshot data between your device and your PC HauteCapture needs the Windows Mobile Device Center to be set up properly. The following sections describe the setup process for Windows 7 and Windows 10. After Windows7 has recognized the device it will install device drivers and the Windows Mobile Device Center automatically. Wait until Windows finishes installing the software. Even though the download page claims that the installer is for Windows Vista it also works on Windows 7. To use HauteCapture it is ok to continue without setting up the device. Click on "Connect without setting up your device"
When you run HauteCapture it should detect the attached device and enable the "Capture" button. If the "Capture" button remains disabled (even after restarting HauteCapture) and the Windows Mobile Device Center reports the device as "Connected" then the device (i.e. its operating system, processor or configuration) is most likely not supported by HauteCapture. Unfortunately the Windows Mobile Device Center no longer runs out-of-the-box on Windows 10. 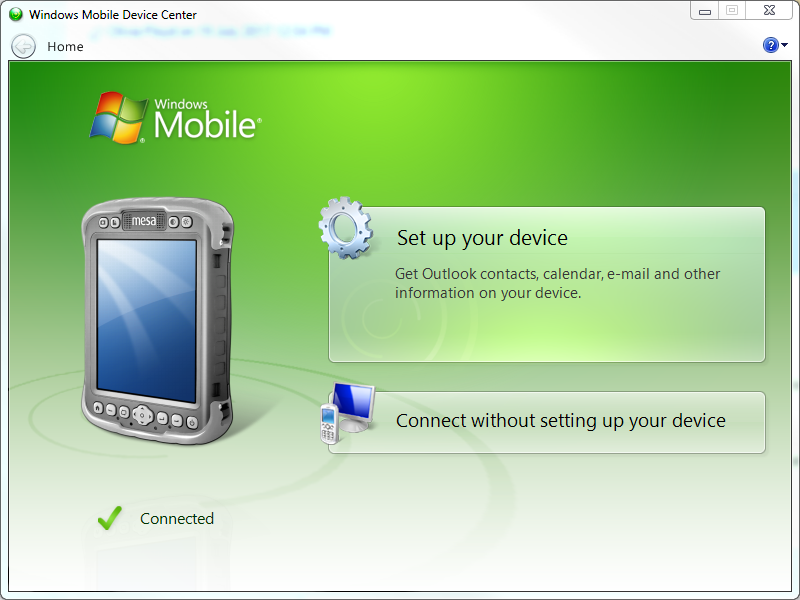 The following instructions help you setting up the Windows Mobile Device Center on your PC and get your device connected and recognized via USB. They were tested on a fresh install of the (at the time) latest build 1803 of Windows 10 but might as well also work on previous and later builds of Windows 10. Even though the download page claims that the installer is for Windows Vista it also works on Windows 10. After .NET 3.5 has been installed the Windows Mobile Device Center installer runs automatically. Run the taskmanager, select "More details" and sort the "CPU" column. Then proceed with step 3.